Chiltern has an array of great options for lunch (light or long), classic sweet treats, belly-busting pub fare and quality produce for the self-caterers. 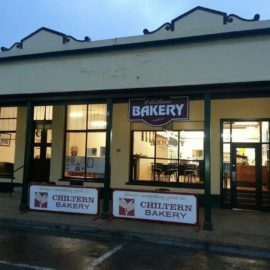 Old-style traditional treats (think lamingtons and scrolls), pies, pastries and house-baked breads can be found at the Chiltern Bakery & Cafe - with eggs & bacon, warm buttered cinnamon toast and breakfast muffins served daily from 7-10.30am. Drop into the friendly folk at the Chiltern Butchery for locally sourced, high-quality meats with a full range of traditional cuts, quick and easy meals and a range of deli meats and salads. Local bees making local honey are hard at work at the Chiltern Honey Farm. Visit to taste and buy pure honey from the farm gate. One of the smallest wineries in the Rutherglen Wine region, Lilliput Wines is dedicated to producing handcrafted, quality wines from grapes grown on the estate (and their wines are vegan-friendly). The Ironbark Tavern likes to mix it up. A few nights a week they serve Thai cuisine with more traditional pub fare and pizza available on the alternate nights. If you want to dine in nature or at your accommodation, they offer take-out as well. 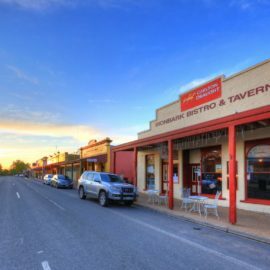 The Telegraph Hotel with its 1950's facade, offers great value steaks, ribs, parmas and pub meals in a relaxed and friendly atmosphere. Hub 62 incorporates a café, art gallery and creative retail outlet. A funky little space with outdoor seating under shady umbrellas, drop by for excellent coffee, home-made cakes and slices and delicious lunches with options for vegetarians and vegans. The Vine is a licensed café/bar located in the historic Grapevine Hotel. It serves a huge selection of craft beers, quality local wines, locally roasted coffee and gourmet pizzas with a casual dining menu (including gluten-free alternatives).